Every now and then one has to simply take a step back and marvel at a magnificent sight. 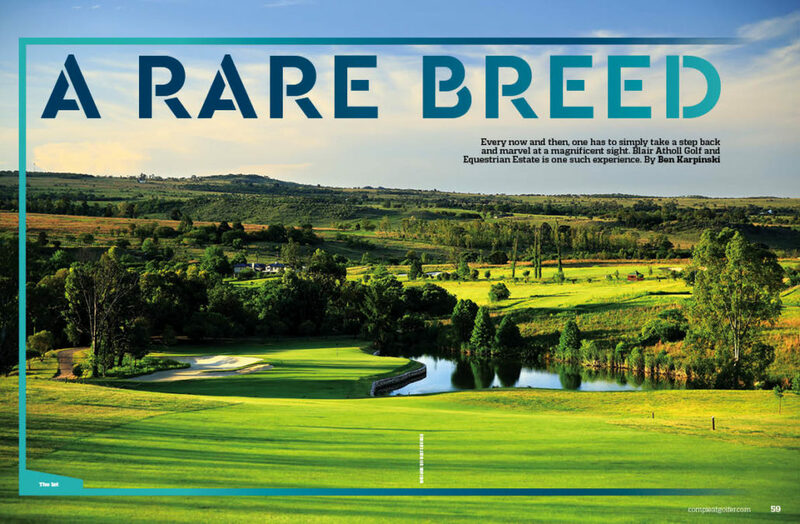 Blair Atholl Golf and Equestrian Estate is one such experience, writes BEN KARPINSKI. Many of the top golf courses in South Africa have one thing in common: they were designed by the legendary Gary Player. When he took to golf design in 1975, he naturally approached the craft with the same determination and professionalism he displayed during his playing career. Over the years his design company’s projects have provided unique golf experiences around the world, but there is something rather special about one particular South African golf course that defines the Player brand more than any other. Blair Atholl is built on a piece of property Player has always held dear. Originally his family home, the Black Knight had a deep desire to create something special in a golfing sense. For over 20 years he thought about the potential of the site he knew so well, and how he could transform it into a world-class golfing destination and residential estate. True to his nature, he did what it took to achieve this goal, and in 2007 the golf course was completed and became the glorious heart of the Blair Atholl Golf and Equestrian Estate. Essentially a members’ course, though one that is open to accepting a select number of guests each year, Blair Atholl epitomises what a premium golfing experience should be. Situated just 5km from Lanseria International Airport to the north of Johannesburg, you are very much in the countryside, while still being connected to everyday life. The estate’s understated elegance is felt right from the entrance, and carries through as you arrive at the stone-cladded clubhouse. You aren’t just playing a round of golf when you arrive here, you are beginning a golfing experience, as Player intended. An American-styled entrance bag-drop sees your clubs get delivered to the practice range as you ready yourself in the luxurious locker rooms for the round. A pre-round trip to the main verandah of the clubhouse presents a fantastic view down the 18th hole, and across to the 1st tee. A short stroll to the range, and you have everything you need to warm up the swing from three spacious cynodon grass tees. Strategically-positioned greens provide ideal targets for all clubs, and there are ample space and alignment points to let it fly with the driver. It’s no wonder locally based European Tour professionals often use the facilities in preparation for events. From there the short-game area brings you closer to the 1st tee and a final opportunity to refine the more delicate elements of your game. Upon arrival at the 1st tee – a relatively ‘friendly’ downhill par-five – you are greeted by a statue of the man himself. In triumphant pose, the Gary Player bronze isn’t just a photo opportunity, but also a reminder that a special round awaits. The term ‘championship course’ is sometimes overused when describing golf layouts, but with the largest greens in Africa, and measuring the longest on the continent from the championship tees, Blair Atholl is everything the term represents, in scale and more. Then there is the Gary Player signature appeal. The first two holes provide a fine illustration of how, with the tee options, the course is designed to test the very best in the game while also giving the part-time golfer a fair challenge. Though the course can lay claim to being the longest, it interestingly has five par-threes. The first and best of these is the 3rd hole, commonly known as the signature hole of the course (see page 65). Back out into the open, the short par-four 4th hole and dramatic par-five 5th take you alongside the Crocodile River, a major natural feature and integral part of the course. There are no two holes that feel similar, with striking elevation changes playing a big part in this, making you think on every hole. As you come to grips with the large greens, you become equally familiar with the large bunkers that protect them; something that creates a distinctive feature on the par-three 6th hole. The ‘front nine’ comes to a curious conclusion as you step off the 8th green. But you will indulge this as nothing more than a quirk, as this position on the property provides perhaps South Africa’s most delightful halfway house experience. With the Crocodile River flowing beneath you, you get to enjoy a tray of delectable finger food, delivered to your table on a sprawling deck area positioned in a small forest. The ‘back 10’, as it were, then ramps things up. On the first eight holes you get the chance to unwind and enjoy your surroundings, but from here you will be presented with some golfing situations that will certainly require the best from your game. Six of the remaining holes have a single-stroke rating index on the card. There is some balance in this, however, with three par-fives on the second half of the course. The first is the 10th hole, which sees you drive down into a small valley before playing back up to another large green complex. If you haven’t become accustomed to using a rake around the greens by this stage, the multitude of bunkers around the putting surface may change this. The next par-five is the 13th that is a little bit more straightforward, but again, it is the greenside heavily guarded by bunkers that may require the skill of a major champion to navigate, depending on the position of the flag. Your chances of scoring birdies after this dry up significantly as a championship finish lies ahead. The par-four 14th measures 437m from the club tee, and will play every bit of it if you fail to get a good tee shot away on this right-to-left hole. You then have the longest back-to-back par-fours in the world. The par-four 15th measures 464m, but thankfully does play downhill to a relatively straightforward green. However, there’s no such luck on the par-four 16th, which measures 484m. It is the stroke one and for good reason too. You cross the Crocodile River to begin the hole from a secluded tee box. The opening from here may seem narrow, but the fairway does open up nicely with a bit more room down the right than you may initially expect. With the hole moving uphill from left to right you may be tempted to favour the right side to shave off some of that distance to the green, but this will make your approach a blind one if you veer too far. The demanding approach needs to hug the left side, as anything short and right will require a heroic sand save for par. Though demanding from a golfing sense, standing on the 16th green and taking in the quiet of your surroundings brings you back to the uniqueness of Blair Atholl and being taken out of the ordinary to enjoy the sport you love. The final short hole of the day, the 17th, is again another tremendous mix of water, sand and elevation change, which leads you to the par-five 18th hole that rounds off the whole experience perfectly. It’s a manageable hole if played with a three-shot strategy, but if you do hit a good drive off the tee, longer hitters will feel the urge to go for it in two. Playing up towards the distinctive clubhouse, the approach will have to carry a small stream that runs parallel to the front of the putting surface. The large greens at Blair Atholl again come to the fore here: so as long as you have enough club you should be able to get home and finish like a champion. Every course, no matter the level, comes with its pros and cons. But Blair Atholl has the feeling that everything is where it should be on a championship layout. Though it is a course that comes with much hype and expectation, it isn’t trying hard to be anything other than Player intended. The natural resources have been used well and his vision is felt across the entire experience. From day one it has been up there with some of the best layouts in the country. Now a more mature and settled course, it is starting to develop even further as a true great in South Africa. There have been some ups and downs along the way, but the focused work of the team under golf director Paul Marks is ensuring that Blair Atholl continues to live up to its immense potential in all that it offers. No longer a ‘new’ course, they are about to embark on a bunker renovation programme. They have created a sizeable cynodon grass nursery to combat the occasional emergence of the less desirable kikuyu, with much being done in this regard to keep the fairways in top condition. Expanding the aesthetics improvement, a first cut of rough has been implemented to further define the holes, along with new cart paths throughout the course for better flow and course structure. It’s the kind of place that could certainly host a big professional tournament, but it is also the perfect place for bespoke golf days where small groups, and indeed its members, can feel perfectly at home. Many are calling for golf to be packaged better nowadays, made shorter, and to take less time. And in many instances I agree with these initiatives. Blair Atholl, though, reminds you about what golf still is in its purest form. It’s about taking the time to appreciate the quality of the sport, superior design, attention to detail and how a round of golf is without doubt a memorable way to spend a day.